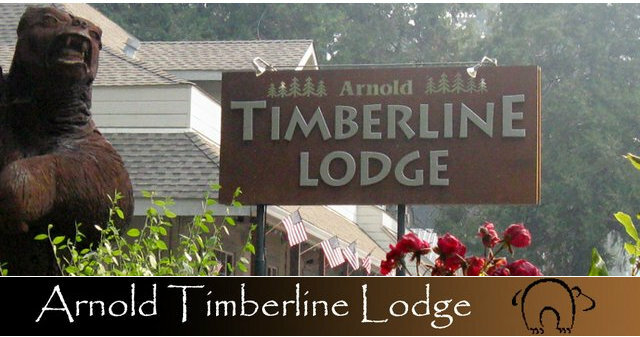 Arnold, CA...Rich in History, Arnold Timberline Lodge is a delightful mountain destination. Think of us as your personal vacation cabin where you can relax and enjoy a comfortable, well-appointed room with all the amenities and charm that make your mountain retreat perfect. The Lodge is centrally located at 890 Hwy 4 in Arnold, making it easy to enjoy all the great food and exciting adventures that await you! Quite simply, Arnold Timberline Lodge is a perfect get-a-way choice just a short, easy drive from your every-day routine. Pine-scented Summer mornings, Star-filled cool evenings, Colorful Autumn afternoons, and Beautiful snow-capped peaks are all yours to enjoy along the Ebbetts Pass Scenic Highway in the breath-taking Sierra Nevada Mountains. Every Season offers new Adventures! Make plans now to visit often, and enjoy them all!